FREE SHIPPING when you order both! I recently received these two books, READING RHYTHMS - Books 1 & 2, from Drummer Cafe member Gaetano Nicolosi and I was very impressed. I've been a fan of Louie Bellson's Modern Reading Text in 4/4 for years, but I have to say that I just may have found a new favorite! READING RHYTHMS - Book 1...teaches you how to read rhythms in three different Simple Time Signatures (2/4, 3/4 and 4/4). It covers Whole to Sixteenths (Notes & Rests) in a wide variety of rhythmic patterns including triplets, dotted & tied rhythms, as well as basic syncopation. The book is well organized, broken into 6 chapters, each containing preparatory exercises and a brief theory lesson on how to read and count the rhythms you are about to learn. 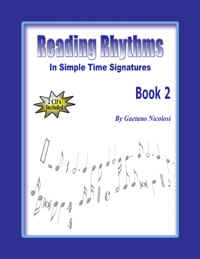 READING RHYTHMS - Book 2 ... continues the study in Simple Time Signatures but includes Cut-time or 2/2 time signatures, as well as an added bonus at the end of the book, and introduction into Odd Time Signatures, namely 5/4 and 7/4. The 5 chapters found in Book 2 go into a deeper study of syncopated rhythms, beginning with Sixteenth Notes/Rests and moves into Thirty-Second Notes/Rests, Quarter Note/Rest Triplets, plus dotted and tied rhythms applied to everything that has been covered, including broken Sixteenth Note Triplets. Like it's predecessor, Book 2 includes preparatory exercises and explanations of the material to be covered, as well as exercises which combine materials from previous chapters. READING RHYTHMS - Book 1 & 2 each come with two supplement CDs which contain an audio performance (Snare drum with Cowbell click track) of every exercise found in the books. The Table of Contents lists where you can find each exercise, both in written form (book) and audio example (CD). There's also some helpful tips on how to practice and use these materials in each books. I highly recommend both of these books ... for the student who has never read music notation to the seasoned professional who wants to expand their rhythmic vocabulary and/or reading skills. If you are an educator / instructor, you'll want to add these books to your library, including it in your lesson plans and course studies. Like Modern Reading Text in 4/4, these books are not just for drummers or percussionists, but for all musicians. Check out Gaetano's website at www.GaetanoNicolosi.com, read the endorsements from the likes of Vic Firth and Johnny Rabb, and order READING RHYTHMS - Book 1 & 2 for your own music library. Watch this 10-minute video of Gaetano (see below) explaining how to use these two books and apply them to the entire drumset.